As evidence grows of significant alterations in the global climate and as we are forced to examine our excessive uses of water, energy, and other resources, we must address the effects these changes will have on patterns of human settlement. 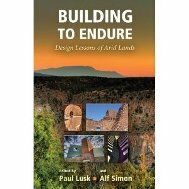 "Building to Endure" looks at the long history of human habitation in the American Southwest and similar arid areas to propose new - and some very old - strategies to meet the challenges of creating more equitable, adaptable, and enduring communities for the twenty-first century. Section one addresses the lessons that can be found in ancient, historical, and contemporary designs and how they might be applied to our evolving role on the planet. The second section applies these lessons to major components of the built and natural environment : urban form, landscape, water, and energy. The final section offers a series of case studies that provide useful examples and practical guidelines for creating affordable, energy efficient, and environmentally sound communities and housing.